Renowned for his distinctive representations of the human form, Antony Gormley is one of the top sculptors to come out of the UK. What with his work being located in a multitude of places around the country, we’ve rounded up some of the best places you can gawk at a Gormley, and enjoy the crisp autumn weather, with our outdoor sculpture stalking guide! For many, The Angel of the North has become the symbol of the north-east, and depending where you’re from, the symbol of home. 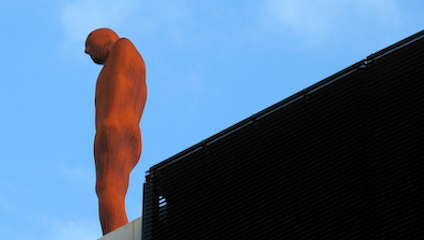 Installed in 1998, Gormley stated he wanted it to be a “focus of hope at a painful time of transition for the people of the north-east” referencing the coal miner’s strikes and subsequent colliery closures. It is made from 200 tonnes of red-brown steel which can withstand wind speeds of more than 100 miles per hour, but that’s not an invitation to put it to the test by racing past it on the A1 in top gear! Whilst you can obviously catch a glimpse from your car, we recommend parking up and walking around the site – after all, how many chances are there to get up close and personal with an angel? Located at one of the UK’s leading open-air galleries York Sculpture Park, One and Other is said to explore Gormley’s personal struggles with isolation and claustrophobia. However, over time the human form has weathered, losing its distinctive features and transforming into a universal, relatable figure. Whilst at YSP, check out some of their temporary exhibitions and other features of their permanent collection, including sculptures by acclaimed artists such as Ai Wei Wei’s Iron Tree and multiple works by Barbara Hepworth. In the crypt of a Winchester Cathedral – one of the largest cathedrals in England - stands a solitary life-sized, lead figure, based on a plaster cast of the artist’s own body. Staring pensively into its hands, Sound II, like Another Place, is another of Gormley’s artworks influenced by the elements. The crypt fills with rain water on damp days, creating a dramatic atmosphere and adding to the reflective theme of the work, as the sculpture is mirrored in the submerged floor. When you visit London’s renowned Roundhouse theatre, you may be expecting to cast your eyes on the stage, not up on its roof. But if you do, you will notice You, another of Gormley’s signature human figures which was installed in conjunction with the theatre’s reopening in 2006. The sculpture looks constrained, its limbs tight to and almost morphing into its body, which some have suggested may represent being squeezed into an urban surrounding, and possibly to be a comment on London life. You foreshadowed Gormley’s 2007 project Event Horizon, where he hauntingly decorated the Southbank rooftops with 31 human figures.